1890s autograph album with inscriptions to both Cora and Ethel, mostly from Artesian, South Dakota. Some of the signers were born in Maine or were descended from Mainers. Some pages were inscribed to Cora, and some to Ethel, and in the same time frame, as though the owner might have been known as both Cora and Ethel, or they were sisters, or best friends. 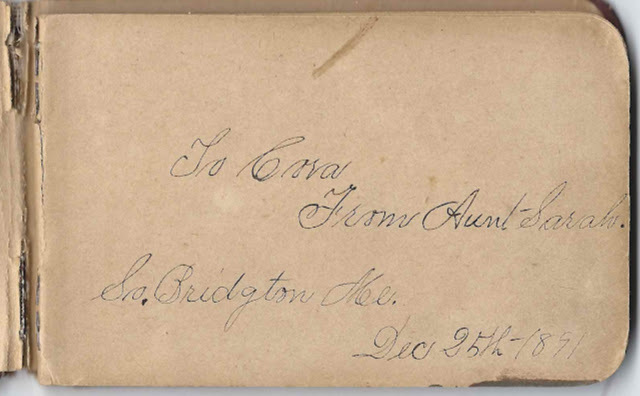 The page below was inscribed to Cora by her Aunt Sarah at South Bridgton, Maine, on Christmas Day 1891. Sarah may have been Sarah (Powers) Berry, daughter of William Harmon Powers and Mary (Andrews) Powers of Oxford County, Maine. The only other signer from Maine in the album was Philip P. Berry. I found a Philip P. Berry from Bridgton, Maine, whose parents were Moses and Sarah P. Berry, presumably the Aunt Sarah who inscribed the page above. 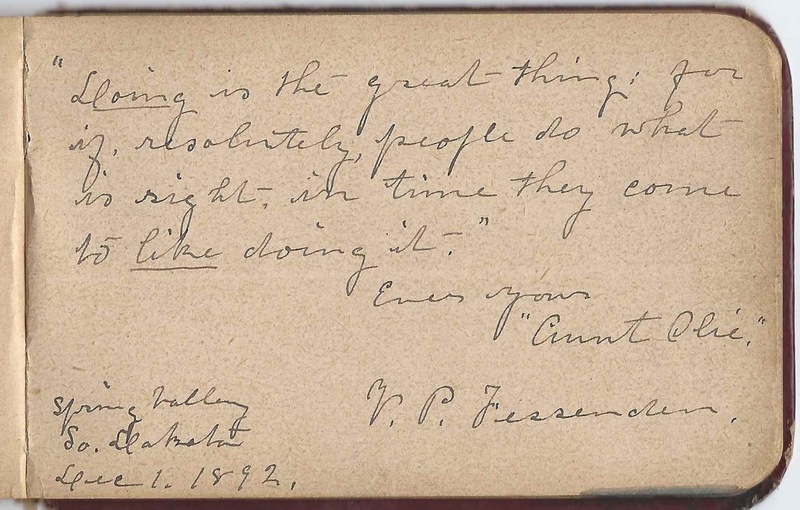 V. P. Fessenden, who was Viola (Powers) Fessenden, a sister to Sarah (Powers) Berry, and thus an aunt to Cora, signed a page at Spring Valley, South Dakota, on December 1, 1892. She didn't indicate her niece's name, nor did her children, Ned and Louie. 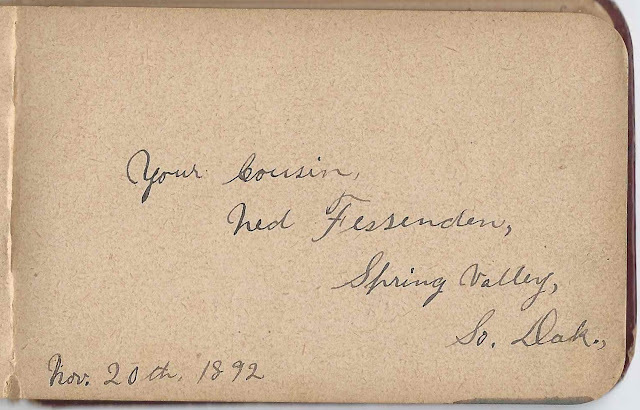 Ned, or Edwin F. Fessenden, signed a page at Spring Valley, South Dakota, on November 20, 1892. I believe the Louie Fessenden who signed a page at Spring Valley, South Dakota, was Viola's daughter Llewella M. Fessenden. Aunt Lizzie signed a page; she was likely Hannah Elizabeth (Powers) Fitch, a sister to Sarah A. Powers and Viola (Powers) Fessenden, and mother to the two signers below, Fred C. Fitch and Maude E. Fitch, and aunt to Cora, if not Ethel. 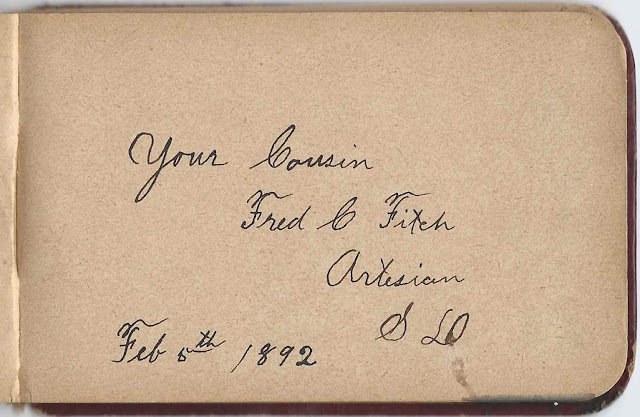 Lizzie's son Fred C. Fitch signed a page at Artesian, South Dakota, on February 5, 1892. 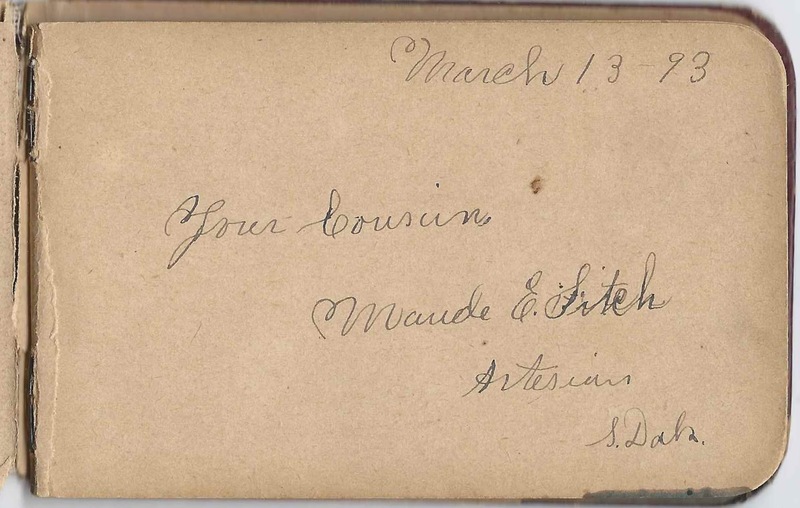 Lizzie's daughter Maude E. Fitch signed her page on March 13, 1893 at Artesian, South Dakota. Wilda Hughes inscribed a page to Ethel at Artesian, South Dakota, in February 1895. Another page was inscribed to Aunt Ethel by Marie Martin, at Van Metre, South Dakota, on April 6, 1928, the only page signed after the 1890s. If you have information to share on the identities of Cora and Ethel, please leave a comment or contact me directly. Thanks! 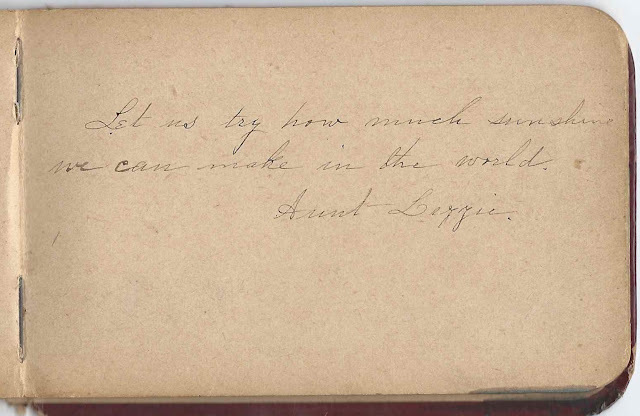 Ethel; some of the pages in the album are inscribed to Ethel; some are inscribed to Cora. Aunt Sarah, Sarah (Powers) Berry, inscribed a page to Cora, signed at South Bridgton, Maine, on December 25, 1891; her son Philip signed the next page on the same day. 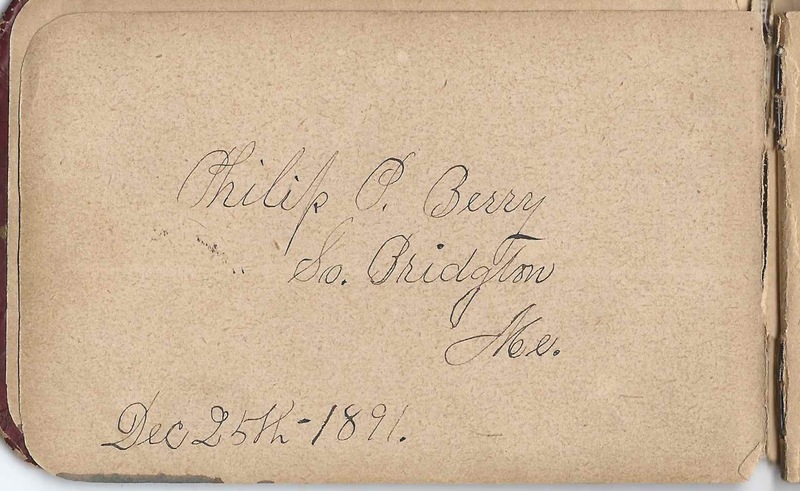 Philip P. Berry of South Bridgton, Maine, signed on December 25, 1891. His mother, Sarah (Powers) Berry also signed a page on that day. He would have been Cora's cousin. Ned enden of Spring Valley, South Dakota, signed on November 20, 1892; mentions a cousin relationship but doesn't specify Cora or Ethel. He was Edwin F. Fessenden, son of signer, Viola (Powers) Fessenden and brother of signer Louie, or Llewella Fessenden. Ned was definitely a cousin to Cora; not sure about Ethel. Louie M. Fessenden, signed at Spring Valley, South Dakota, on November 29, 1892; Llewella M. Fessenden, daughter and sister of signers Viola (Powers) Fessenden and Ned Fessenden; she mentions a cousin relationship but doesn't specify Cora or Ethel. She was definitely a cousin to Cora; not sure about Ethel. 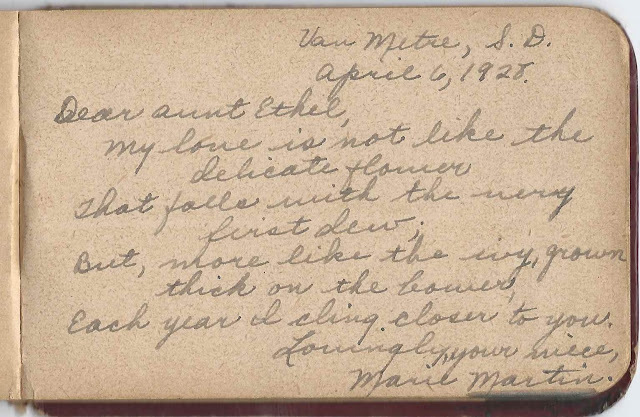 Maude E. Fitch, signed a page at Artesian, South Dakota, on March 13, 1893; expresses a cousin relationship, though she didn't specify Cora or Ethel. We know she was a cousin to Cora as Maude's mother signer Hannah Elizabeth (Powers) Fitch was a sister to signers Sarah (Powers) Berry, who called herself Cora's aunt, and Viola (Poweres) Fessenden; not sure about a relationship to Ethel. Aunt Lizzie, Hannah Elizabeth (Powers) Fitch, sister of signers Sarah (Powers) Berry and Viola (Powers) Fessenden. Her children Fred and Maude also signed pages. She didn't specify Cora or Ethel, but she was definitely Cora's aunt; not sure about Ethel. 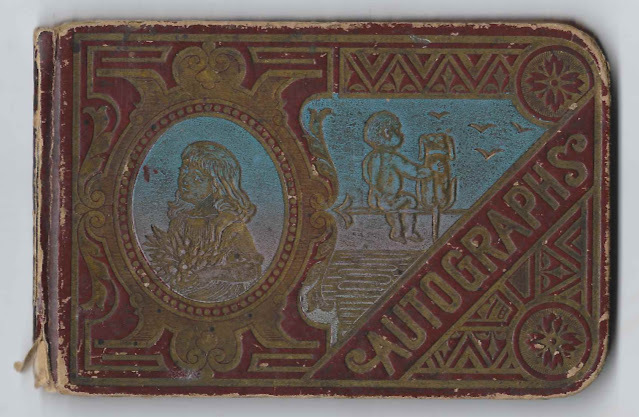 Clara Sanmark, signed at Artesian, South Dakota, on January 7, 1895; inscribed to Ethel. Bertha Sanmark, signed at Artesian, South Dakota, on January 7, 1895; inscribed to Ethel. 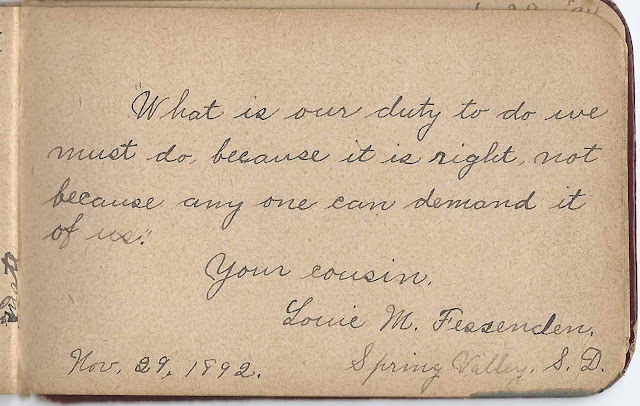 Teacher Frank Schuyler, inscribed to Ethel during the Winter term on November 20, 1894. 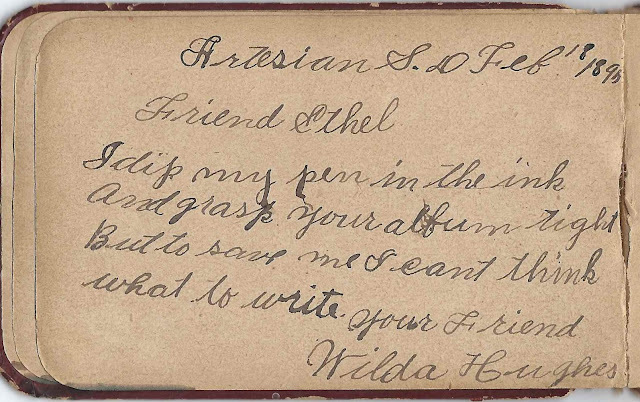 Hattie A. Thomas, signed at Artesian, South Dakota, on August 19, 1894; inscribed to Ethel.